Once a sleeping giant, China today is the world's fastest growing economy, the leading manufacturer of cell phones, laptop computers, and digital cameras, a dramatic turn-around that alarms many Westerners. 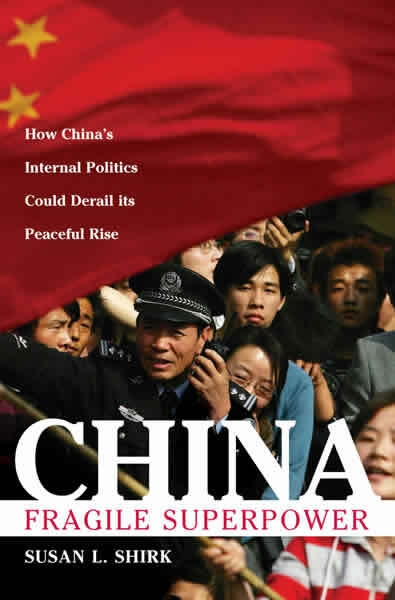 But in China: The Fragile Superpower, Susan L. Shirk opens up the black box of Chinese politics and finds that the real danger lies elsewhere, not in China's astonishing growth, but in the deep insecurity of its leaders. China's leaders face a troubling paradox: the more developed and prosperous the country becomes, the more insecure and threatened they feel. Shirk, a former Deputy Assistant Secretary of State responsible for China, knows many of today's Chinese rulers personally and has studied them for three decades. She offers invaluable insight into how they think, and what they fear. In this revealing book, readers see the world through the eyes of men like President Hu Jintao and former President Jiang Zemin. We discover a fragile communist regime desperate to survive in a society turned upside down by miraculous economic growth and a stunning new openness to the greater world. Indeed, ever since the 1989 pro-democracy protests in Tiananmen Square and the fall of communism in the Soviet Union, Chinese leaders have been haunted by the fear that their days in power are numbered. Theirs is a regime afraid of its own citizens, and this fear motivates many of their decisions when dealing with the U.S. and other foreign nations. In particular, the fervent nationalism of the Chinese people, combined with their passionate resentment of Japan and attachment to Taiwan, have made relations with these two regions a minefield. It is here, Shirk concludes, in the tangled interactions between Japan, Taiwan, China, and the United States, that the greatest danger lies. "Shirk has written an important book at an important moment, with the Beijing Olympics approaching and a new Chinese product scandal breaking practically every week. China: Fragile Superpower should change our assessment of China's leadership, which is a lot less stable than many of us thought." "Susan Shirk has written the definitive book at the right time. For those seeking an. objective look at the new China, your search is over. The bonus is that Fragile Superpower is as fascinating as it is informative. A great accomplishment."